Sergey Brin has once again hit the town with Project Glass - but this time he let someone else wear Google's augmented reality headset. California Lieutenant Governor Gavin Newsom wore the specs on The Gavin Newsom Show, and later told Wired about his brief experience with one of the world's most rarefied pieces of technology. "You can easily forget you have them on, and sense the capacity of use in the future," Newsom told us, adding the headset felt incredibly light, comfortable and inconspicuous on his head. Brin and his wife, Anne Wojcicki, appeared on Newsom's Current TV talk show Wednesday, May 23 to discuss Project Glass and Sergey's work in the Google X labs. 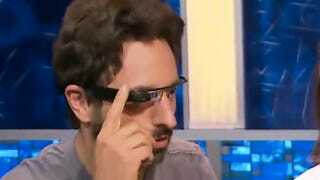 On the show, Brin also provided our first glimpse into how the Google Glass interface is navigated. In the video, Brin navigates the system via a touchpad on the right side of the headset behind the display. He slides his finger forward and back to locate a photo he took of Gavin Newsom with the contraption. He then places the headset on Newsom's face, and continues to navigate until the photo is located. He also tells Newsom, "Don't touch the pad on the side" while setting up the headset for the talk show host. Unfortunately for inquiring minds, when Newsom asked how the photo was taken, Brin didn't answer. Newsom told Wired that he was impressed by the image quality of the display in the glasses. The politician-slash-talk-show-host noted that the lighting on his set is less than ideal for demoing a display, but nonetheless the "image was remarkably clear." ‬After returning the glasses to his own face, Brin swiped down on the touchpad of the glasses and continued the interview. The down-swipe could possibly be used to exit the photo album he was demoing to Newsom. Whatever the case, Brin's swipes answer questions about how the interface is navigated. Brin told Newsom that he brought a rough prototype. "I have some hopes to maybe get it out sometime next year," he told Newsom, "but that's still a little bit of a hope." With this in mind, it's possible that what Newsom demoed on Wednesday could change radically before the final production model hits the market. Nonetheless, even at this early stage, the glasses are impressive, Newsom says. He told Wired that the headset was "a heck of a lot further along than people have imagined." The Google co-founder told Newsom that Google X is now his primary focus at Google. His team has been working on the glasses for two to three years, and Brin as been involved for the past year. Brin also explains why Google is working on the technology: "The idea is that you want to be free to experience the world without futzing with a phone." One concern with wearable computers is that they're cumbersome wardrobe additions. To this point, Newsom told us that he was surprised by "how unremarkable the glasses are except for the remarkable feature." That said, when asked if he would actually wear the glasses himself - you know, in public - the lieutenant governor replied, "I haven't seen the video yet, so I'll withhold judgment until I see myself. I'm hoping this isn't my Dukakis moment." You can watch the full interview on Friday, June 1 at 8 p.m. Pacific on Current TV.